Hot on the heels of Council discovering a load of dumped asbestos in North Lismore, officers have now found around 150 tyres dumped on the side of Eltham Road near Bexhill. 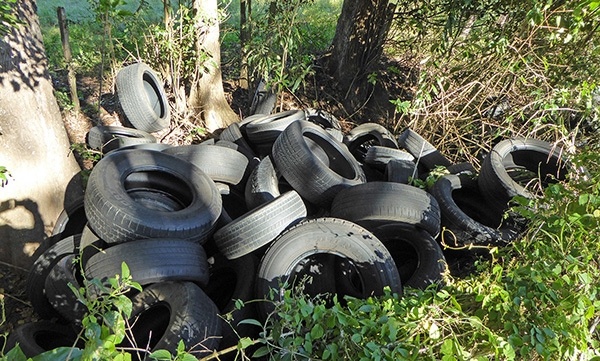 The tyres are believed to have been dumped sometime over the weekend and Council’s Environmental Compliance Officer Stuart Thomson said initial investigations suggest they may have been dumped by someone who deals in large-scale tyre replacement. “It’s disgusting. Waste tyres are classified by the NSW EPA as ‘Special Waste’ which like asbestos is a class of waste that has its own regulatory requirements due to the potential environmental and human harm the product can cause if it is not disposed of in a proper manner,” he explained. Council is appealing to anyone who may have seen a large truck on Eltham Road at Bexhill acting suspiciously between 6pm on Friday, 13 July 2018 and 8am on Sunday, 15 July 2018. “I would be very interested to speak to any person who has had what appears to be the two front tyres off a large 4WD that were completely bald on the inside of both tyres replaced recently. The tyres were Maxxis 980 Bravo A/T tyres,” he said. Stuart said that often people complain that tip fees are too high as an excuse for illegal dumping, but he assured residents these fees are in place with good reason. “The fees people pay for the disposal of hazardous waste is for the extraordinary process involved in disposing of this kind of waste. Labour costs are generally higher as is the cost to recycle or safely dispose of the materials,” Stuart said. Anyone with information about the tyres should phone Stuart immediately on 1300 87 83 87.